People love installing a pool in their home and we know that anyone will but it is a bit difficult for home-owners who have a small backyard. Small backyards by default, do not have ample space for the designers to create a cohesive pool experience. But this does not make it impossible for the home-owners to have a small backyard pool landscaping! Here we have mentioned a few small backyard pool landscaping ideas that can enhance and elevate the overall appeal of the pool while being a functional landscape accessory. With less space on disposal, the area becomes the ultimate priority while designing a small backyard. The optimum utilization of the space without over-crowding becomes a major concern. 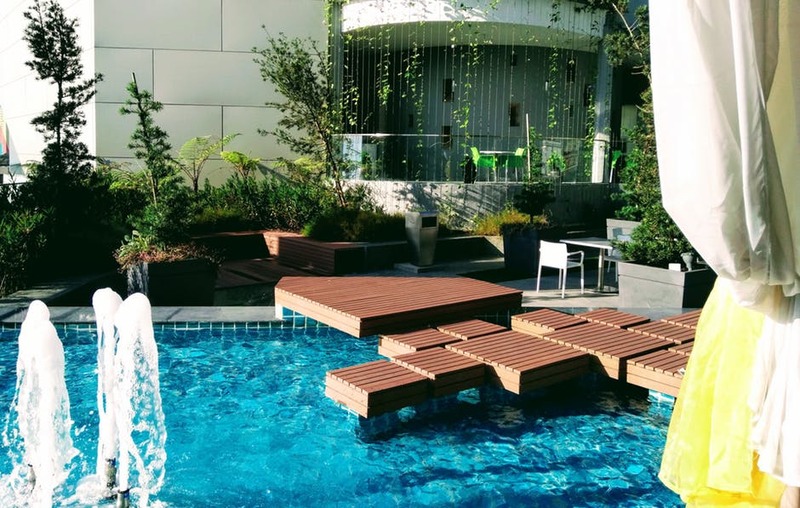 To ease this process, there are several pool landscaping ideas that use specially designed storage benches. The benches are placed along the outer perimeter of the area or along the fence, to let your backyard be as large and open as possible. Even you can try that! Keep the benches as far away from the pool, in order to let people access the pool easily. Such outdoor benches are also an excellent storage space for pool toys, pool gears, garden tools or grilling equipment. You can also add movable patio tables and chairs around these seatings and have an impeccable entertaining area in form of your small backyard. If your small backyard has a little garden around the pool, then pavers can help the pool be clean and away from dirt and grass. Stepping stones or pavers are designed to form an ultimate walkway that cuts down the mess drastically. These stones can help the swimmers’ feet be clean and so allow the pool to be clean. If you wish to incorporate this amazing pool landscaping idea in your backyard then you need to know that pavers come in a variety of colours and shapes, letting you have a design that blends well with your overall small backyard landscaping design, which can include the existing patio and rocks. There are many small backyards that have a pool that takes up the majority of space in their backyard. This does not allow people to have a proper space to walk around or even mowing the lawn. If you are someone with a small pool backyard design then it is time to make the most of your space. People with such a backyard will just let the grass grow wild but we would like them to take matters in their own hands and create a pebble garden which can beautifully take up your space. This pebble garden can be a few feet to just a few inches wide that can cover the entire length of the pool or the outer area or line of the property. You can choose to add different rocks like river rocks or ground quartz chunks or colourful stones. All these pebbles can elevate the appeal of your furniture and existing yard area. With these pebbles, your small backyard will surely have a clean look. Plants act as a great visual barrier for your pool because they can help enhance any design for a pool even in a small backyard. Thus, such plants are bound to get soaked or splashed. This has led us to let you know on the kind of plants that you should or can install around your pool landscaping design. What should you make sure? Let the plants be a bit far away from the pool as they can bring in the dirt or even scratch or harm the swimmers. Plants can be flowering and thus rich with nectar. This can attract many butterflies and bees. If you do not wish to have these butterflies or bees near your pool, choose plants that are not flower or fruit bearing. Need more help with Small Backyard Pool Landscaping Ideas? Get in touch with Land-con. We have over 20 years of experience in designing the best landscapes for all backyard sizes. Log on Toronto pool and check out our gallery to learn about our previous landscaping projects. Get into the pool life with Landcon!